Homes, churches, weddings, and funerals all provide occasion for us to welcome and receive our honored guests. Broadman offers you a black guest book with a bonded leather padded cover, rounded corners, gilded gold page edges, and ribbon marker. This 46-page book lays flat for the easy signing of over 600 names and addresses. All pages have "We welcome you in the Lord" at the bottom of the page and are acid free. 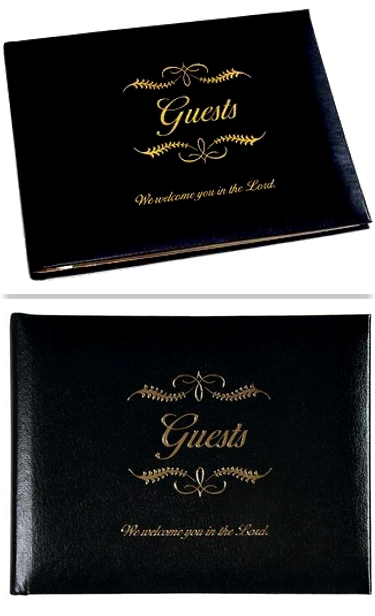 This 7 3/4″ x 5 3/4″ book is black with gold lettering on the cover and comes in a gift box.